Those looking to save big on some of the most popular toys right now can take advantage of the Argos Half Price Easter Sale which offers massive discounts at all nationwide stores across the UK. As always, there is lots to choose from at Argos with some of the highlighted sales including Power Ranges, Lego, Barbie, My Little Pony, Hot Wheels and Vtech. 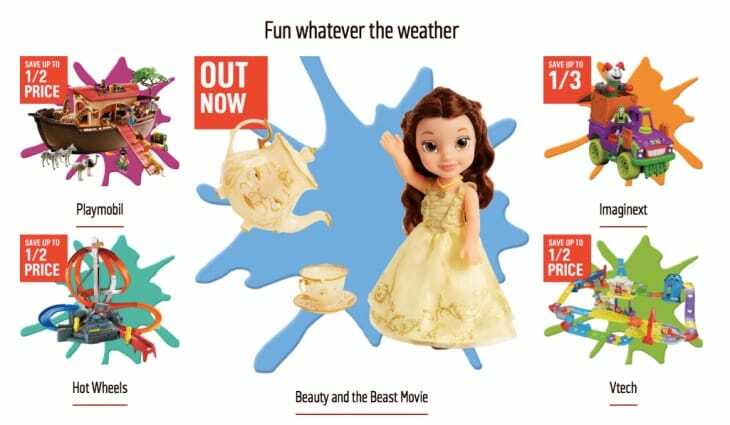 Where to find the Argos Half Price Toy Sale for 2019: All of the deals for April are live at the Argos website here just click what you like to get started and see the discounted prices. When is the next Argos Half Price Toy sale: Keep checking this page as it will be updated regularly with information on how to access all future Argos sales. Leave a comment below if you would like to know any specific questions. just picked up a half price scooter for my son, thank you!! Is it only for toys or electricals as well? Argos Half Price Toy Sale is now on for February 2018! 2 for Â£15 on hundreds of toys. Nerf is 20% off, 1/3 off Barbie and much more. Check out the sale through the links above.